- Two user access levels: supervisor and operator. This device simulate a artificial aging of dental samples by a temperature cycling test. For this, the sample is immersed with a sample basket alternately in a hot water bath and a cold water bath. The typical use in the field of dental research is the implementation of aging simulations of dental implants. The device contain a SPS control, a keypad to enter the test parameters and a display for indicating the current cycle number and remaining time. Immersion times, dripping and number of cycles cCan be adjusted. The machine is completely made of stainless steel to avoid corrosion. The end position after the test can be adjusted (cold/hot bath, air). Different processes can be saved. 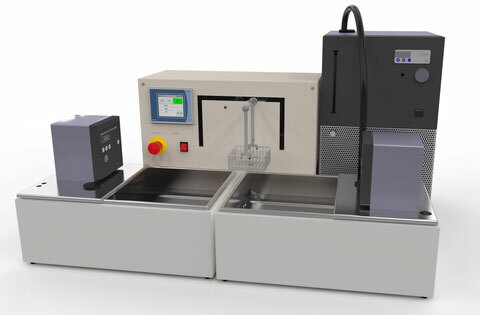 Due to the compact construction this device is ideal for laboratory use . Curves and processes can also be edited and managed on a PC. The data is transferred to the PLC via an Ethernet interface. Immersion Time Hot Bath 0-999 sec. The illustrations may differ from the actual equipment. All data without obligation and not-binding.